Last summer, Weddings on Wirt Street had two openings: the first was for the community, wedding officiants, and the Courthouse staff; and, the second, for fellow business owners, neighbors and friends. 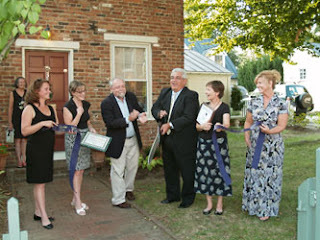 We want to thank the Town of Leesburg and Loudoun County for a successful Ribbon Cutting on August 31st, 2010. Town Council Member Marty Martinez cut the ribbon and County Supervisor Kelly Burk presented us with a plaque honoring the opening of the business. We are grateful for the support shown us. Everyone joining us for these events had a grand time.